Tennis top stars don't miss a chance of watching the Euro 2012 football matches. Some cheer for their national teams on Facebook and Twitter, and comment every aspect of the game, while others just send support messages to their fellow countryman footballers. Still at Roland Garros, Rafael Nadal and Novak Djokovic enjoyed some football before their final. The Spanish watched the first games from group B - Germany-Portugal and Denmark-Netherlands - on Saturday, June 9, just a few hours before the French Open final. He posted on Facebook he was watching football to relax just before going to bed. Novak didn't miss the opening matches of the Euro 2012. 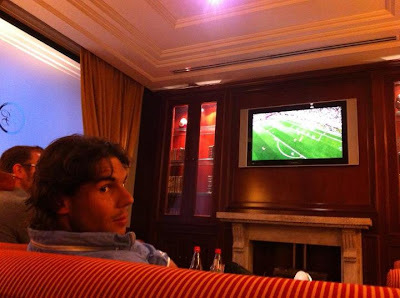 There he is watching Russia-Czech Republic on Friday, June 8, and resting after his intense semifinal match against Roger Federer. German player Andrea Petkovic posted on Facebook a message to her fans saying that she will off course cheer on Germany. "Today [last Friday, June 8] is kick-off for the European Championship, so I and other German Sportswomen and men tried to sing our national anthem and explain what it means to us", said the WTA player. You can watch her support her national team by clicking here. Robin Soderling, as a proud Swedish man, as been following his team very closely. During the matches he posted several messages on his Twitter. He even sent a message to England before the match against Sweden: "How can England be so sure to get 3 points against Sweden when the last 7 matches ended with 5 draws and 2 wins for us? Play first talk after :)" Unfortunately, Sweden lost to England 2-3, and is out of the Euro 2012. 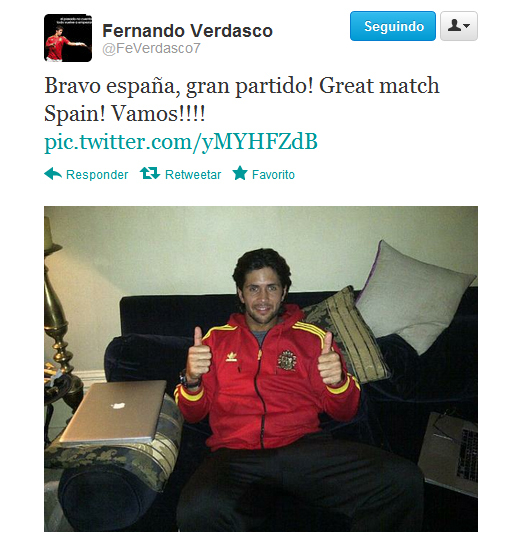 Spanish Fernando Verdasco is following the Euro 2012 with close attention. He is cheering for Spain but has been watching almost every game, judging by his posts on Twitter and Facebook. Less than an hour ago, he said he was on his way home and is looking forward to watch Portugal vs. Holland. Here is one of the photos he posted the day Spain defeated Republic of Ireland 4-0. Tennis legend Martina Navratilova is happy for her country mates of Czech Republic. "The Czechs are in the quarters at euro 2012 - well done!!! 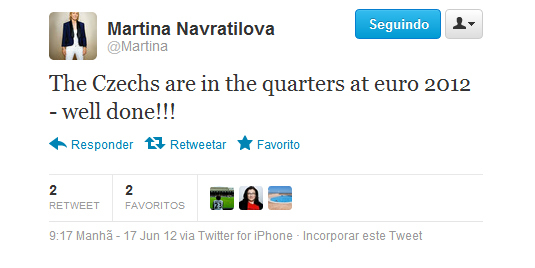 ", said Martina on her Twitter this morning. The Czechs qualified yesterday after beating Poland 1-0.